Ah, eggplant, how I love you. 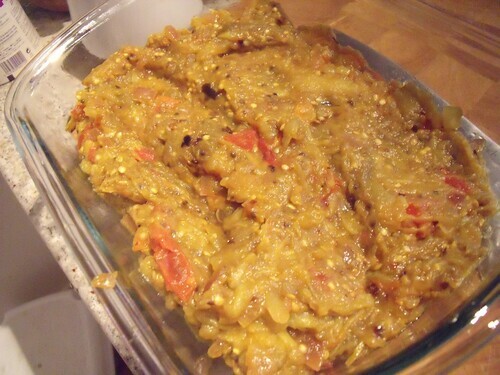 My most favourite of all the Indian dishes is Baingan Bharta, eggplant that is roasted then mashed and cooked with my favourite Indian spices. I have made so many variations of Baingan Bharta over the years, but I think that this is my ultimate one that I will keep making forever more. Yup, it’s just that good. Even if you don’t like eggplant, give this one a go. The mashed texture and warming Indian spices make something so different from how you’ve had eggplant in the past — trust me. It’s worth it. Preheat your oven to its highest broil setting for broiling, or to 425F for roasting. Pierce the eggplant all over with a knife. I make about 8-12 small slits for steam to escape. Then place the eggplant directly on the top oven rack, with a baking sheet lined with aluminum foil on the rack below to catch drips. Broil or roast until completely tender inside. This can take 5-25 minutes, depending on your oven and the tenderness of the fresh eggplant. 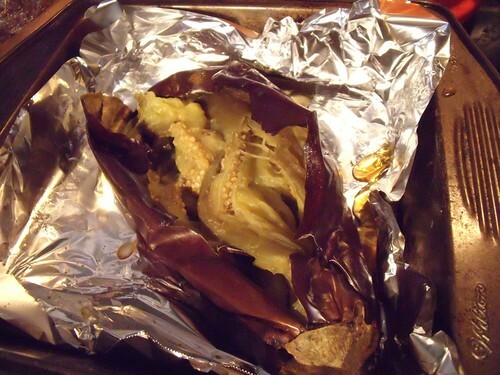 Remove eggplant from oven and let cool. Once the eggplant is cool enough to work with, remove the skin and discard, keeping the insides. 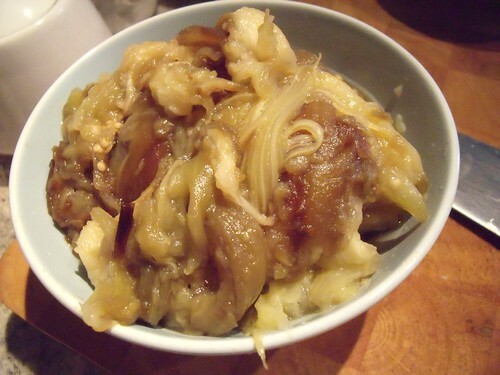 Mash the eggplant insides and set aside. While the eggplant is roasting, you can prepare the rest of the dish: in a large pan, heat the oil over medium-high heat. Add the mustard seeds, and heat until they begin to pop. Add the onion, garlic powder, asafoetida, turmeric, coriander, chili flakes, and salt, and saute for 2 minutes. Add the tomato and saute for another 2 minutes. At this point, you can set this mixture aside until you have your mashed eggplant ready. Then add the mashed eggplant, and saute for 5 minutes. Serve hot, garnished with cilantro, alongside chapati, brown rice, and your favourite curries (maybe a Red Lentil Dhal and Curried Okra?). Enjoy with great delight. MMMMMMMMMMMM,..I love roasted aubergines & all Indian too!